Sauteing the apples first caramelizes the sugars on the exterior of the apples, bringing out the flavor and intensifying their inherent sweetness. 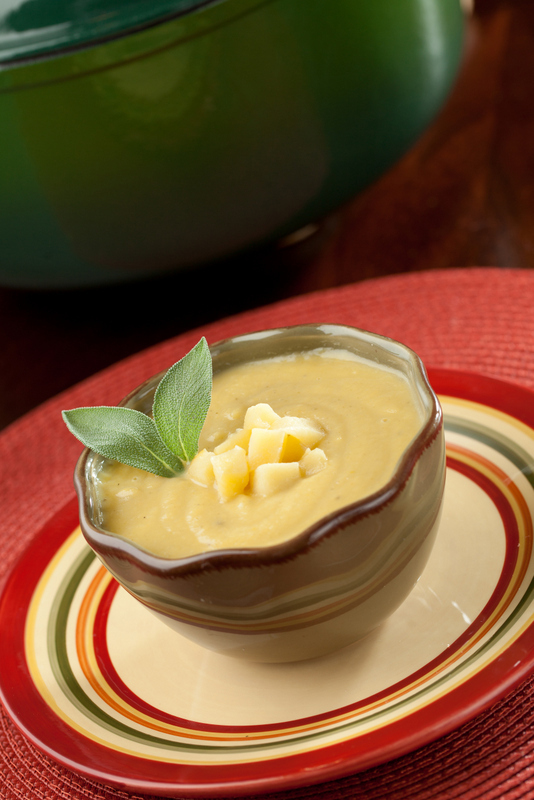 Fujis, with their complex spicy flavor are the perfect apple for this sweet soup. Place chopped apples in a large mixing bowl and squeeze ½ large lemon over the apples, tossing to coat. Melt butter in a heavy large soup pot over medium-high heat. Add apples and sauté for 2-3 minutes. Add apple brandy and continue sautéing, stirring occasionally, until golden brown and the brandy has been absorbed (about 5 more minutes). Transfer apples to a bowl and set aside. Add olive oil to pot and heat for 2 minutes until hot. Then add leeks, shallots and salt. Sauté for about 2-3 minutes, then add the carrots and parsnips and continue to stir until all the vegetables are coated with oil and slightly tender (about 2 more minutes). Add half of the caramelized apples, stock, cider and chopped sage. Stir to blend and bring to a simmer. Reduce the heat to low, cover and simmer for another 25 to 30 minutes or until all the vegetables are tender. Using an immersion blender or a food processor, puree the soup (in batches if using a food processor/blender) until the consistency is a fine puree. Return puree to the soup pot (if using a food processor) and heat on low. Add half & half, and season to taste with more salt and freshly ground pepper and nutmeg. Serve each bowl topped with a few teaspoons of the reserved caramelized apples. Garnish with a sage leaf and enjoy!